Lately I was not feeling much hopeful. To be honest, I'm still not on the level I usually am. That's the mayor reason why I had my mouth (and fingers) shut. It's that time of year again. Time I absolutelly don't like at all. Hate would be the closest feeling I feel. The time between DST and Winter Solstice. This days slowly kill me. I leave our home in the dark and I come home in the dark. Hell, feeling like I'm a vampire - going to the coffin (read my office) in the morning before sun comes up and returning to my family in the afternoon, when the nigh already falls. Yesterday it was fine day. I saw the sun after - yup, it was more than a week... We have a huge oak tree standing near the house and I absolutelly adore it, but when the fall comes, the lawn is full of leaves. So in the afternoon I took kids and we went outside to grab leaves from the lawn. Was that good idea or not, I won't talk about it. 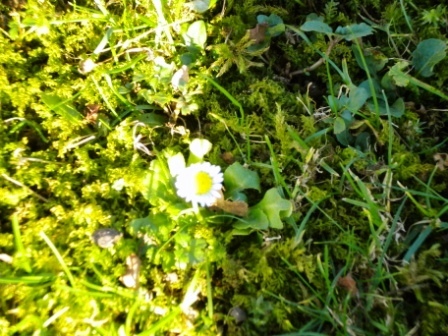 When I almost finished grabbing I found a small daisy blossoming out of the grass. That no matter how cold or dark or lost I might feel, I have the will to rise and survive. I have hope.